Safe For Your Vegetables, Flowers and Lawn. Concern Weed Prevention Plus is proven effective against most common garden and lawn weeds, Yet, it's safe for people, pets, fish and wildlife because it's made entirely from one of nature's most wholesome grains--corn. Works as a pre-emergent weed killer, preventing weeds' roots from developing so the new seedlings quickly die. Effective against dandelions, smooth crabgrass, clover, giant foxtail, creeping bentgrass, barnyard grass, and most other garden and lawn weeds. So safe, the U.S. Environmental Protection Agency exempted it from herbicide regulations. NEW formula starts working fast, you see results fast. Ideal for use in and around your driveways, patios, fences, trees, flowerbeds, mulched areas and vegetable gardens. Pre-mixed and pre-measured, so you're always ready to spray. Available in 24oz., Gallon and 1 Gallon bottles. 4 Months of Protection! Extended Control Round-Up Concentrate now adds long staying power. Extended Round-Up will kill grass and weeds and prevent them up to 4 months. Includes a free measuring cup. Mix 1 gallon for every 6 ounces. Treats up to 1200 square feet per bottle! NEW formula starts working fast, you see results fast. Ideal for in and around your driveways, patios and fences. Round-Up Alternative! Remuda is a 41% concentrate of glyphosate herbicide the same active ingredient as Roundup. It is a non-selective systemic material that controls both broadleaf weeds and grasses. Remuda is systemic so it goes through the leaves to kill the underground roots. 41% Glyphosate Concentrate with surfactant Broad spectrum post emergence herbicide Kills many annual and perennial grasses and broadleaf weeds. Available in Pint, Quart, Gallon, 2.5 gal. size. Gets rid of weeds fast. Great for perennial flower beds, vegetable gardens and even around fruits! Weed-Aside, a blend of naturally occurring fatty acids kills annual weeds in a few hours to 2 days. Affects only plants it touches, so if used with care, it won't harm your garden plants. Won't stain brick or paving. Mix 1 part concentrate with 5 parts water. Pint makes 96 oz. Effectively controls dandelions and most broadleaf weeds! May be used as a spot treatment over troubled areas or as broadcast spray over the entire lawn. Kills bindweed, chickweed, clover and other weeds. Not for use on St. Augustine, bahia, carpet or centipede grass. 1 pint with treat approximately 4,800 square feet. When it's growing on your lawn, garden, patio or on the roof or side of your home, moss is no better than any other unwelcome weed. In fact, when growing on sidewalks, brick patios and other walkways, moss can be unsightly. Our tests have shown that Weed-Aside works much faster and more thoroughly than similar products. A blend of naturally-occurring fatty acids, Weed-Aside kills weeds, then quickly decomposes in the soil. WOW! controls crabgrass, creeping bentgrass, foxtail, lamb's-quarters, purslane and other weeds just after they germinate, before you even notice them. Signature Product It's easy to apply and saves you time and effort -- you can weed and feed your lawn naturally with just one application! WOW! Plus lets you control crabgrass, dandelions and other pesky weeds while feeding your lawn with a complete, balanced, all-natural fertilizer. It's easy to apply and saves you time and effort -- you can weed and feed your lawn naturally with just one application! At Mobile Craftsman, we understand that in today's fast-paced world, some find it difficult to keep up with their own needs, let alone the maintenance of their home, business or landscape. Prompt Dependable Service: Mobile Craftsman will not make an appointment it cannot keep, or there is a $50 credit applied to your signed work order. We protect the environment that exists and clean up when we are done. We're there to finish your project. Customer Protection: Mobile Craftsman is a licensed and insured company. Quality workmanship adds value to your greatest investment. Poor workmanship simply means it will have to be fixed later. Why not do it right the first time? Initially call Mobile Craftsman. Kitchen and Bath Remodeling will increase the value of your home. Is your gravel landscaped yard starting to look so weedy that the rocks and landscape plants are hidden? Is your HOA sending you letters about your weed problem? Are you having guests over that might be unpleasantly surprised when they see a yard full of weeds? Will you be listing your property on the real estate or rental market soon? If you answered yes to any of these questions, e-mail or call us for a free estimate. We also added a new tool which efficiently aids in removing larger weeds (roots of 12 inches or larger) as well as the "desert broom," an invasive shrub in Tucson which causes a lot of allergy problems for many people. The tool sold by Ergonica is the Weed Twister (http://www.weedtwister.com). We now offer an organic alternative for preemergence weed control called corn gluten. Please refer to Q7 / A7 in the "Questions and Answers" section for more information. We currently service several accounts with the City of Los Angeles, East LA Metro Project, but are also available for residential and commercial services. Homeboy Maintenance is a division of Homeboy Industries, a Los Angeles based non-profit organization. 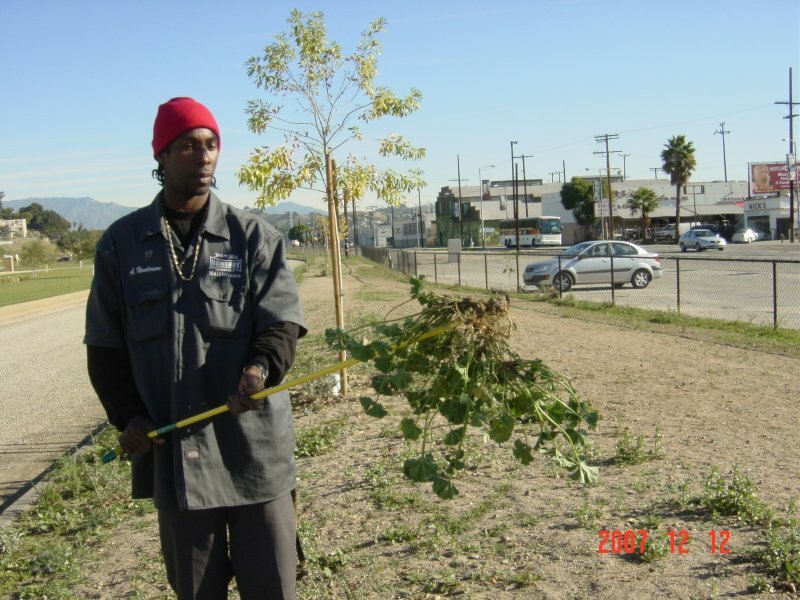 We employ at-risk and formerly gang-involved youth, giving them job skills and a living wage in an effort to assist them become positive, contributing members of their community. By offering positive alternatives to gang violence, we provide opportunities amid a lethal absence of hope. Profits from Homeboy Maintenance help support Homeboy Industries' many programs, including education classes, mental health counseling, tattoo removal, and job placement assistance, all offered free of charge to our clients. A large mallow weed is no challenge when removed by this Homeboy Industries maintenance specialist, with the help of the Ergonica Weed Twister. Homeboy Maintenance serves the greater Los Angeles, California area.